With a 3.53 GPA in economics and finance and a 3.42 ERA as the starting pitcher for the Point Park Pioneers, Derek Peluso excels both in the classroom and on the baseball field. Based on his academic and athletic achievements, Peluso, from Zelienople, Pa., was named a 2011 National Association of Intercollegiate Athletes Baseball Scholar-Athlete. Luis Palacios-Salguero, Ph.D., assistant professor of economics and finance, commended Peluso's accomplishments. "Derek is a very intelligent student. I have enjoyed reading a number of his answers on exams and homework assignments, as well as his essays," said Palacios-Salguero. "He shows a very good understanding of economics, both in theory and practice." The economics and finance major at Point Park teaches students how to understand the implications of economic events and policies, both nationally and internationally. In addition, students develop a solid understanding of how financial markets operate and how to make effective investment and financial decisions for firms and individuals in today's global economy. "I chose economics and finance as a major because of my love of math and working with numbers and graphs," said Peluso, who is also a member of Point Park's Chi Alpha Sigma National College Athlete Honors Fraternity. "I wanted to learn how money works in today's economy and get a degree in something that was fairly broad-scoped so I would have a variety of job options after I graduate," he added. Peluso aspires to be a professional baseball player but plans to pursue a career in finance if baseball does not work out. "I've been playing baseball since I was seven years old. I hope to play it as long as I'm able to," said Peluso. Over the years, 15 players from Point Park's baseball team have been drafted by Major League Baseball. In addition, the team has made it to the NAIA World Series 10 times. "Point Park is preparing me well for both careers. The University takes great pride in its student-athletes," remarked Peluso. In addition to earning a baseball scholarship, Peluso also chose Point Park because of its urban location. "I wanted to go to school in a city. Pittsburgh is a wonderful city and I love being able to call it home," he said. 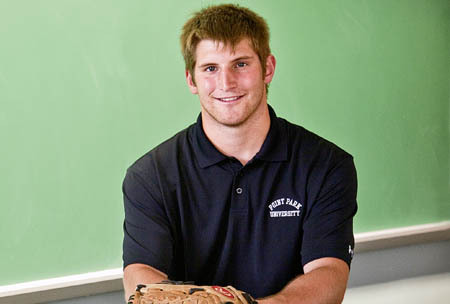 "Both the city and the baseball team's successful history were major influences on my decision to attend Point Park." According to Peluso, Point Park has an advantage over other universities because of its small class sizes and helpful professors. "I usually only have 30 students in each of my classes and the professors here do an excellent job of reaching out to every student in order to help them be successful." 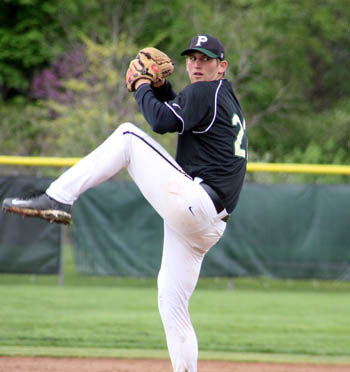 This fall Peluso will be a senior at Point Park and will pitch his last year for the Pioneers. "Derek has demonstrated that he is a mature, thoughtful, and responsible student. I am positive that he will succeed in his professional and personal life, and I wish him the best," said Palacios-Salguero.